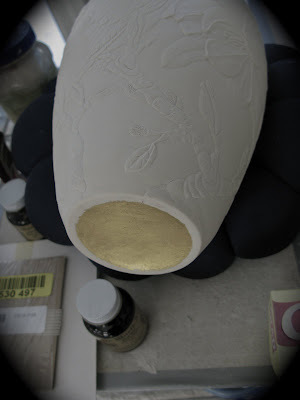 JoAnn F. Axford: A little "Bling"
I've been putting gold leaf on the recessed bottom of my one of a kind pieces to differentiate them from my slipcast pieces. What a lovely idea. That will make them just a tad more special than they already are. Are you going to do a tutorial on how to do the gold leafing ??? Looks like you are applying it before the bisque fire and i'm curious as the dickens . . . Your pieces are gorgeous as always !!! Chae/Lee, I apply the gold leaf after the final firing, after I have finished hand polishing the piece. Gold leaf is not fired on. Thanks for your interest. I am wondering if you sell your artwork? Your pottery is unique and very detailed. Thank you Pranita. I exhibit throughout the country in various juried shows. My work is presently at the Warm Springs Gallery in Charlottesville, VA in the "In Bloom" exhibit. I usually post on facebook when my work is at a gallery. I think I will start posting on this blog also. Thanks for the idea!